One particular challenge facing property owners involves the special problem of high traffic areas. In many locations, heavier than normal foot traffic will leave visible traces. 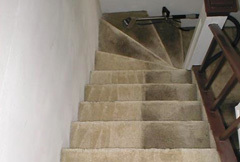 Often, carpeted stairways, front entrances or corridors reflect the signs of heavy daily use. This issue frustrates home owners and businesses alike. Periodic professional steam cleaning can solve this problem. Hot steam gently removes embedded debris, ground-in dirt and scuff marks. It helps revive worn flooring. In carpeted locations, the pressure of extensive repetitive traffic may compress thin fibers in carpeting; the process of professional steam cleaning helps restore and refurbish these spots, preventing strands of fibers from clumping together permanently and helping to disentangle matted areas without damage. Elegant carpeted and tiled floors represent a significant financial investment. Property owners want to maintain these surfaces in a clean, attractive condition. Heavy use may limit the effective lifespan of carpet prematurely, unless steps are taken to revive carpeting on a regular basis. Most household vacuum cleaners cannot perform this task effectively. Professional steam cleaning can. Obtaining periodic professional steam cleaning services to keep heavily utilized sections of flooring refurbished helps revitalize the appearance of high traffic zones. It may restore the uniform beauty of carpeting. Our company serves Monmouth and Ocean Counties in New Jersey. We will help you maintain high traffic areas of residential or commercial floors in clean, refurbished condition. Professional steam cleaning remains one of the safest, most natural ways to achieve high quality commercial carpet cleaning and residential carpet cleaning. We take great pride in performing thorough, comprehensive steam cleaning services. The results will delight you! 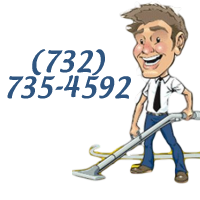 We offer quotes for professional steam cleaning services free of charge and without obligation. To obtain a quote, or to book an appointment, simply fill out the form above. You can also contact us at 732-735-4592.